Path Expert™ is a robust pathology reporting and management software that is easy-to-use, and fully customizable. It allows any Pathology Lab to deliver professional reports to their clients online, quickly and securely. 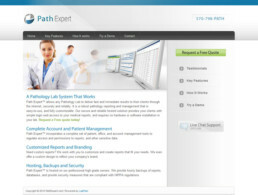 Their reliable hosted solution provides clients with simple login web access to medical reports, and requires no hardware or software installation in the lab.